Our co-host Dr. Sharmini Long is joined with her husband, Dr. Joshua Long, as they share their journey of when she was diagnosed with metastatic papillary thyroid cancer. They discuss how their faith and trust in God helped them through this trial. 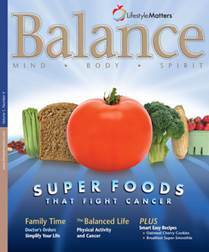 Offer Description: Discover super foods that fight cancer—naturally! Learn 6 tips for fighting back when cancer strikes. Plus: Simplify your life and reduce stress in 4 easy steps.